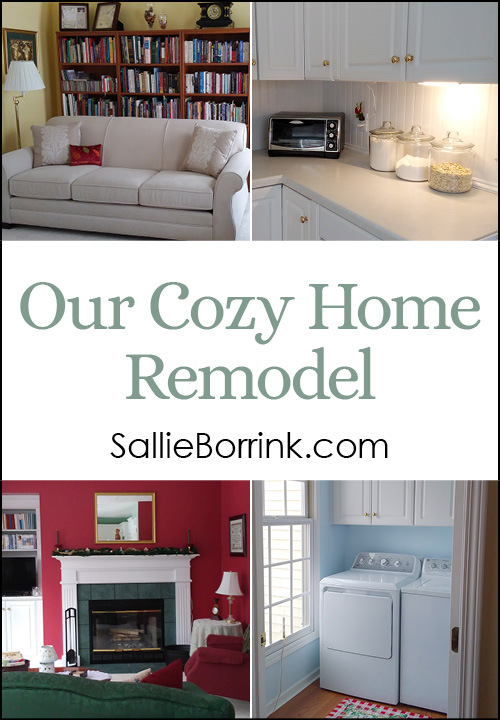 Last winter we made the decision to make an investment into updating a number of areas of our house and began our cozy home remodel. We had lived here almost six years and had done very little except the office and laundry room. We had hoped to paint a lot of the house the week before we moved in, but due to bank craziness at the end we only had two days to move. (We had sold our previous house months before and were renting it back from a very patient buyer.) It left only enough time to paint Caroline’s room and that was really pushing it. Things that were okay when we moved in now looked quite worn. Many of the paint jobs were not well done. For example, one of the things I love about the house is all the white woodwork. But it had been painted relatively poorly. Most of it was a more yellowish tinged white paint sprayed on by the contractors when they built the house so it definitely lacked that fresh crisp look. (We are only the second family to own this house.) So every bit of white you will see in all the pictures – trim, doors, baseboards, fireplace mantle, windows, pocket doors, etc. – was painted at least twice and in many cases three times by David. It was a lot of detail work. We made a list, prioritized, price shopped, re-prioritized, shopped some more, and finally decided what we would do. There was no way we could do everything we desired so we had to decide what would give us the most bang for our buck and what would make the biggest difference in our enjoyment of living here basically 24/7. David did almost all the work himself since hiring any of it out would have cut down significantly on what we could do. I helped a bit with some of the trim painting, but wasn’t much help due to the chemicals and smells. My dad came a couple of times to help with flooring and my dad, brother, and nephew came to help one day in the kitchen. We had an installer for the carpet, kitchen counters, and gutters. 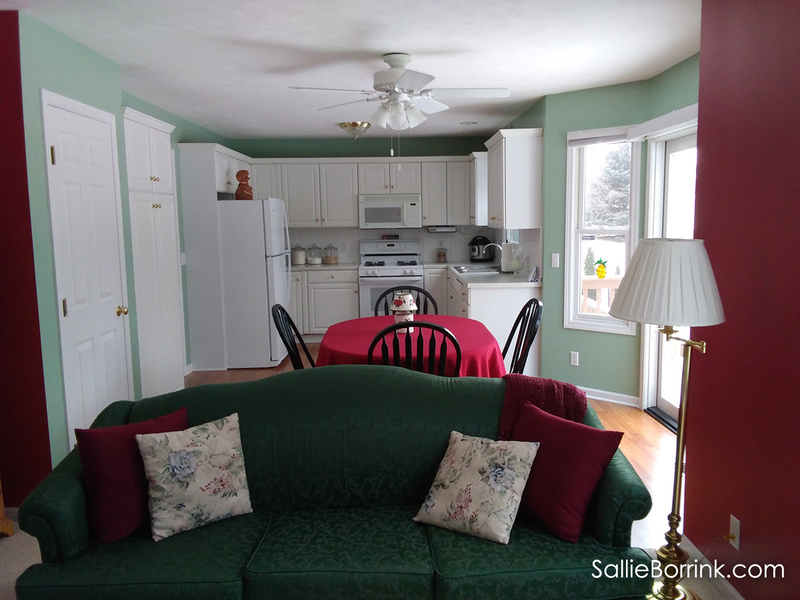 Otherwise, David did everything – painting, laying laminate flooring, kitchen backsplash, etc. So from April when we started Caroline’s room (which I wrote about here – Decorating a Tween Girl’s Bedroom) until mid-August we were in renovations. I’m so thankful we did them, but there were a few mornings in late July and early August I got up and had reached the point of tears. It was hard to have the house torn up for that many months in a row. I think I would rather move than renovate again. 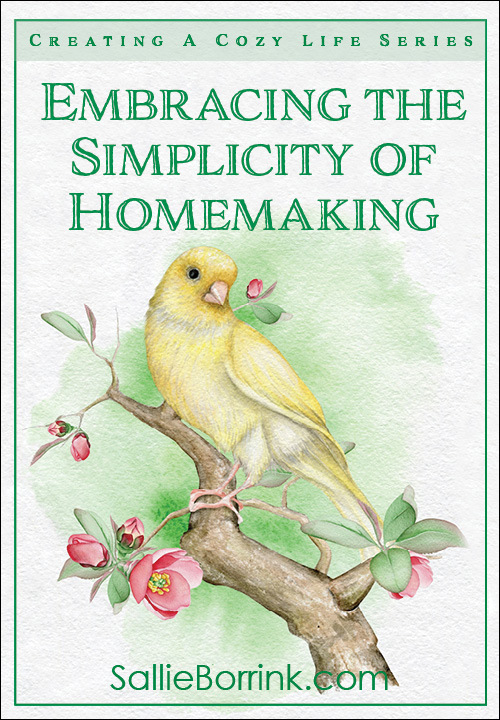 Our home is where we work, homeschool, and rest. It’s our sanctuary and having it torn up was challenging. But I’m thankful we did it! On to the pictures! This is technically our living room. For the past four years it was our homeschool learning room. It’s now the library. 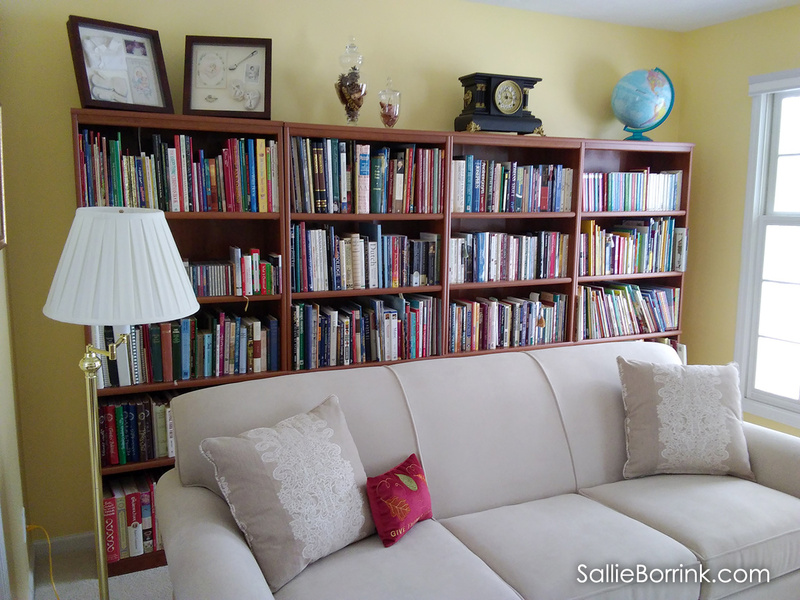 My mom had the idea to line the walls with the bookcases and put the couch in front of them. If we were to decide this is our forever house at some point, I would change this to a full wall of built-in white bookcases. We tried a lot of different yellow paint samples and, in the end, chose the exact same yellow the previous owner had put in here. I just love how cheerful this room is with the yellow. It’s also very cozy in the evening when the lamps are on. We already owned the four bookcases that matched. We have enough books still in the basement to fill at least three or four more, but four is what we can put in here. (That doesn’t include all the other bookcases we have throughout the house.) I have the books roughly organized by topic, but I need to do some weeding, more organizing, and add quite a few more. 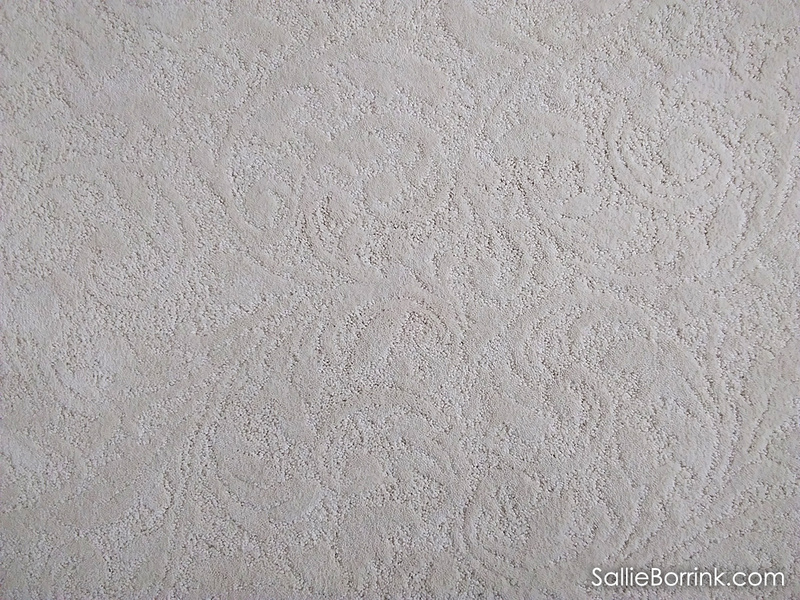 We chose a beautiful off-white carpet. I know most people with families would never choose this, but there are only three of us and we have no pets (other than fish). I knew that this carpet was going to probably be my carpet for a long time so I wanted something I really liked rather than settling for something. I also wanted a neutral so if I wanted to buy different family room furniture at some point, I had that option. So we spent more on this carpet to get something of high quality that we not only liked but could handle fairly heavy traffic since we are here all the time. It adds so much to the house and works well with our furnishings. Caroline asked why I didn’t put this away with the fall things. I said it was going to stay out all year. 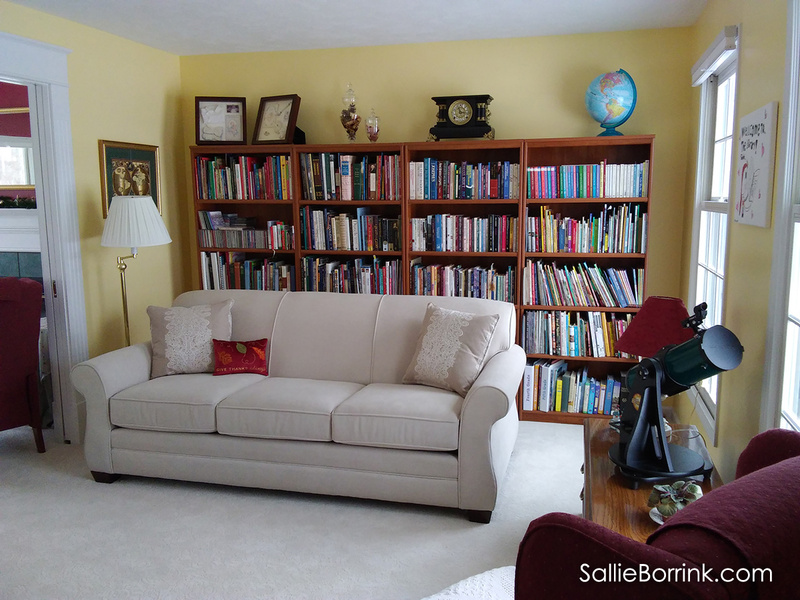 While I knew I wanted to keep the library yellow, I struggled with the color for the family room. It was a taupe with a suede texture when we moved in. We were keeping our furniture in here since new wasn’t in the budget. I also liked the green tiles on the fireplace and they were in excellent shape so there was no reason to change them. So we were working with the greens and reds. I did not want to do the exact same taupe color, but we also had to figure out a color that would flow with the rest of the first floor. Every sample we tried in the taupe family wasn’t right. Although I wasn’t sure about red, we tried some samples on the wall and found one we both really liked. I love it. I can’t imagine anything else in this room. My very favorite place in the entire house is that chair, sitting next to a fire and reading. I also love the new firewood holder we purchased! LOL! It’s the little things in life. The cabinets and appliances were staying. The only things we would change in here were the countertops, the backsplash, and the paint. The wood laminate floors would also change since we were doing all of those throughout the house (first floor, bedrooms, and office). I knew from the very beginning I wanted warm oak laminate floors. Timeless. Prior to this, the countertops were a dark green laminate which was fine with me, but they were very worn and chipping. I really like dark green countertops and seriously considered doing it again. (I had put them in my previous house when we redid that kitchen!) I did not like the backsplash which was basically one row of cheap white tiles running along the bottom of the wall along the laminate. 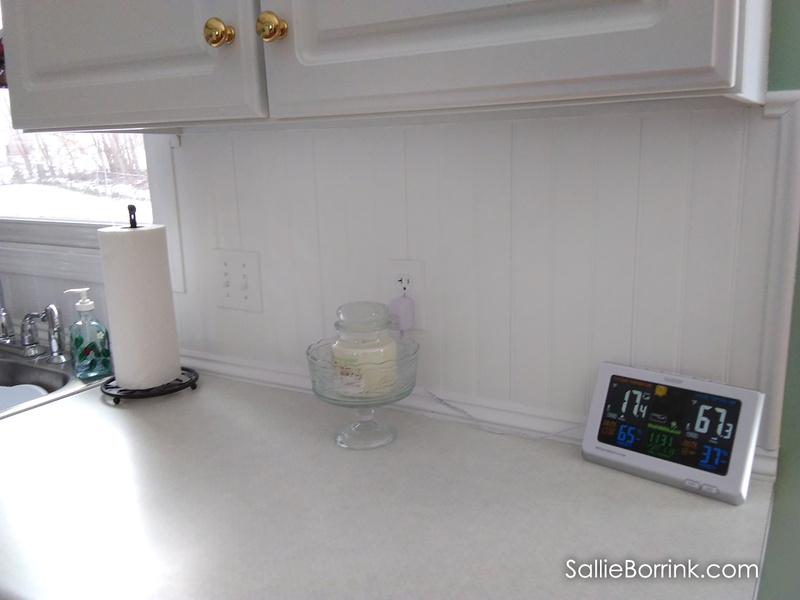 I stalked Pinterest and blogs for a long time looking at beadboard backsplashes. I knew that was what I wanted. We found the right panels for it at Lowe’s. I also wanted a neutral laminate countertop that was pretty. Granite, quartz, etc. were not in our budget and I had no interest in granite anyways. 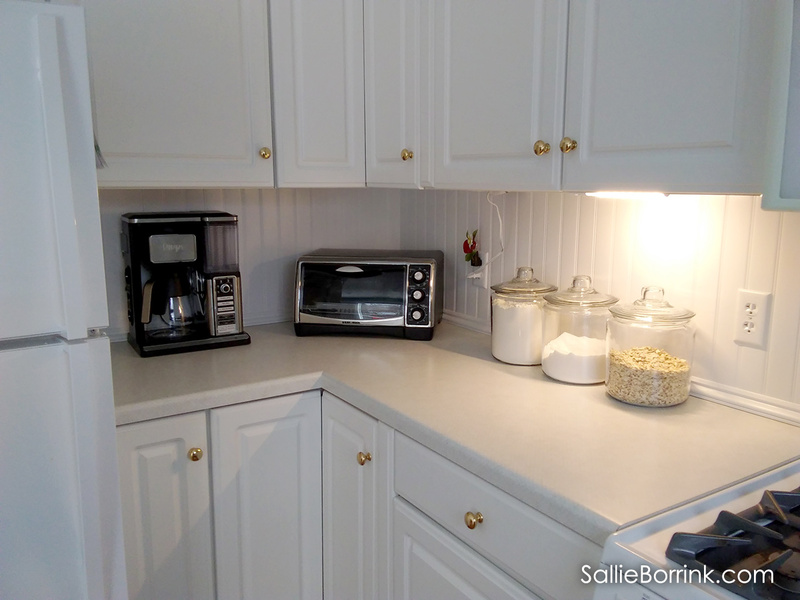 Some of the white quartz is pretty, but it would make no sense to spend a huge amount on countertops on older cabinets. Plus, it wasn’t remotely in the budget. 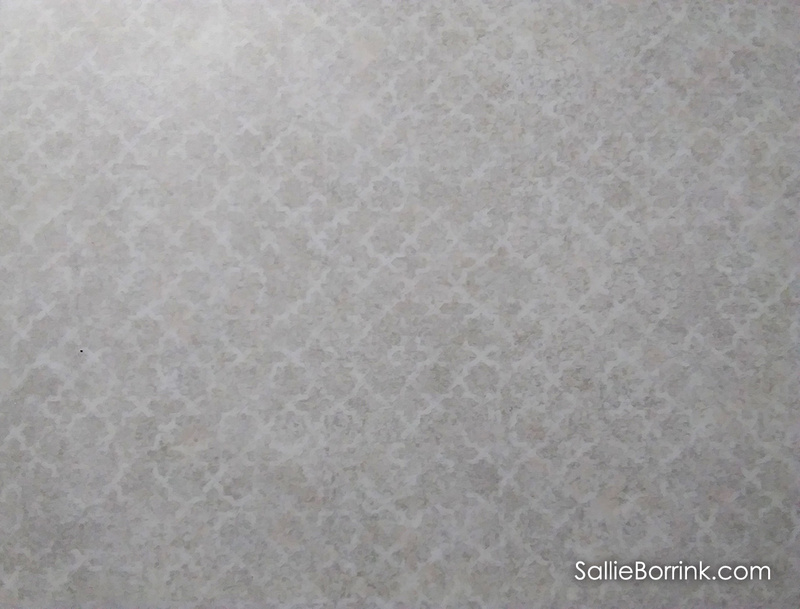 So we found this Wilsonart Gesso Tracery laminate with a muted quatrefoil pattern. It’s hard to get an accurate picture of it. The picture makes it look really gray, but it isn’t in person. It has gray in it, but it comes off as more very light taupe. Cozy corner for baking and making coffee! 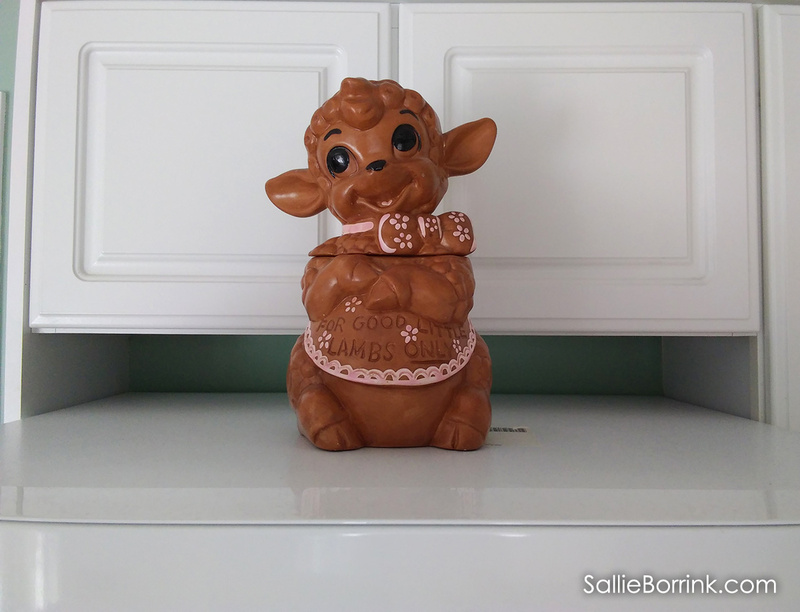 This antique cookie jar dates back to my early childhood. 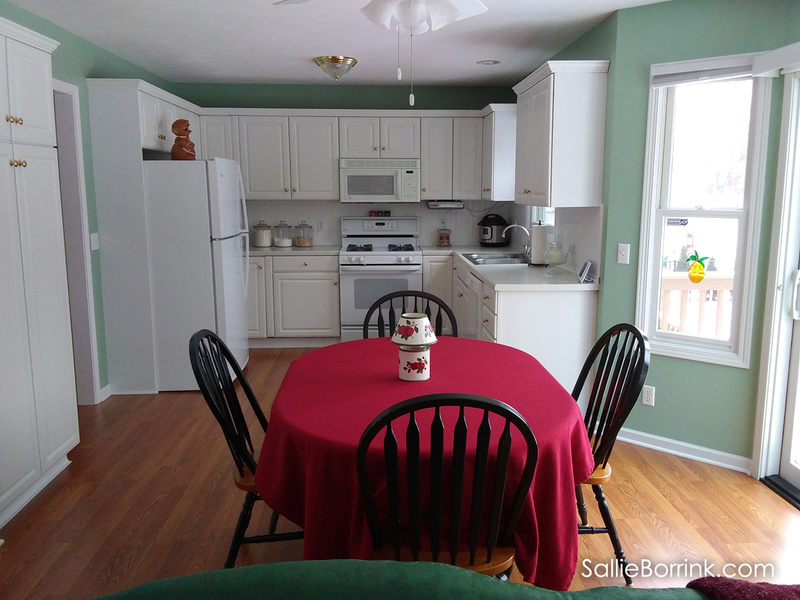 One of the things I really liked about our previous house was the separate dining room. I would not have chosen to have the kitchen, dining area, and family room all as one long room, but we loved pretty much everything else about this house so this is one thing I live with. One of the things I love about this house is all the windows. One of the things that drives me nuts about this house is the lack of wall space because of all the windows. I’d choose the windows every time, but I really miss having lots of wall space for pictures, furniture, etc. One task David did not get to last summer was painting the table and chairs. That will be for this spring. We’ll paint it all black. Right now it is black and maple. I like the black and maple combo, but stripping and refinishing the maple top and chair seats will be too much work so it will all get prepped and painted. I also need something different for the centerpiece, but that’s what I had on hand to go with the red tablecloth after Christmas so that’s what I’m using! There are windows all along the back of the house so we get lots of natural light. I love that. 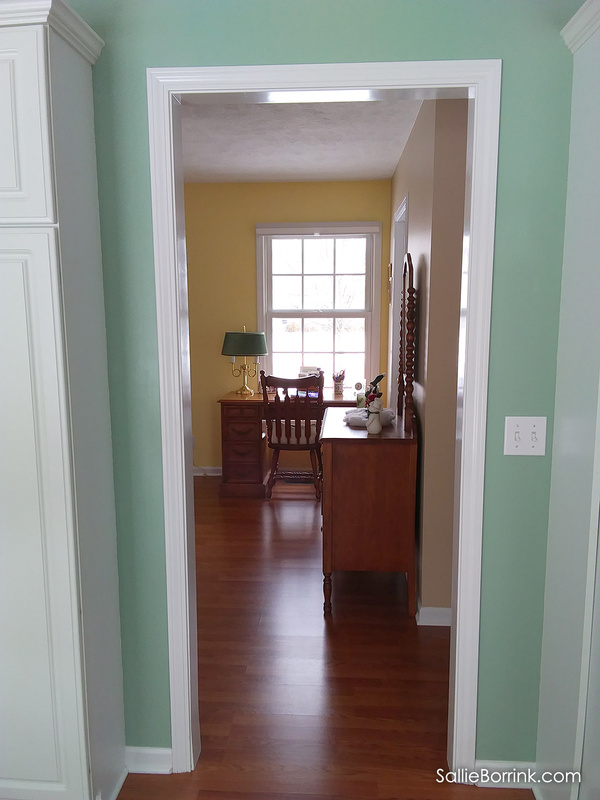 This is looking from the dining area/kitchen to the front entry hall. Yes, my home is full of brown furniture and I love it. I have lots of solid oak furniture and I wouldn’t trade it for the cheap IKEA stuff for anything. This was my grandmother’s dresser and mirror. I stripped it and refinished it before I met David. It holds placemats, tablecloths, aprons, and napkin rings. This is the view from the front door if you look left. The closed door is the laundry room. We painted all these walls. 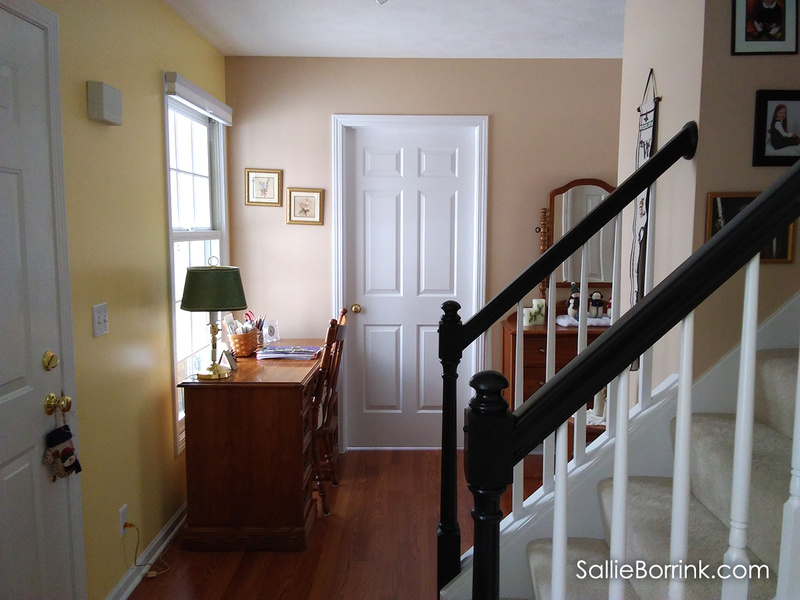 Prior to this, the banister was white with grayish oak hand-railings that did not match the new floors. I wanted black so David painted them. This is the front entry when viewed from the library. That desk was a gift from my parents when I started college. It’s solid oak and heavy! LOL! You can see this back entry wall in one of the previous pictures. This is looking out from the half bath. I wasn’t sure what to put on this wall since it is quite large. At one time I was an avid cross sticher and I had many completed projects packed away. I realized how dumb it was to not enjoy them after all the work I had done so I arranged them here. The bottom left one of the quilt was done by David’s maternal grandmother. The bottom right one I did in high school. The rest were done either before I met David or the first few years we were married. These antique plates belonged to my grandmother. They hang above the entry coat closet. There are still more things to get to this spring and summer, but they are on a smaller scale. The only big thing we didn’t get to is ripping out the master bath oversized tub and shower surround and tiling it all in. David was out of energy to take on another project of that size so we pushed that back a year. Hopefully we can take care of it this year. We’ve been looking at tile and have a plan in mind. 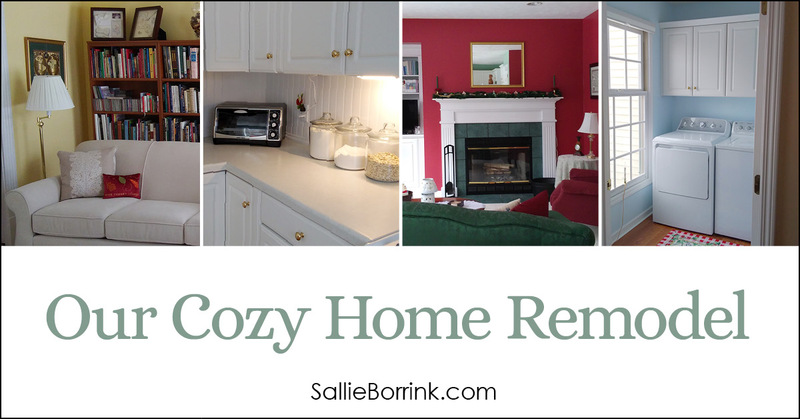 I hope you enjoyed seeing a little bit behind the scenes here at our cozy home! Oh, the red is just BEAUTIFUL! 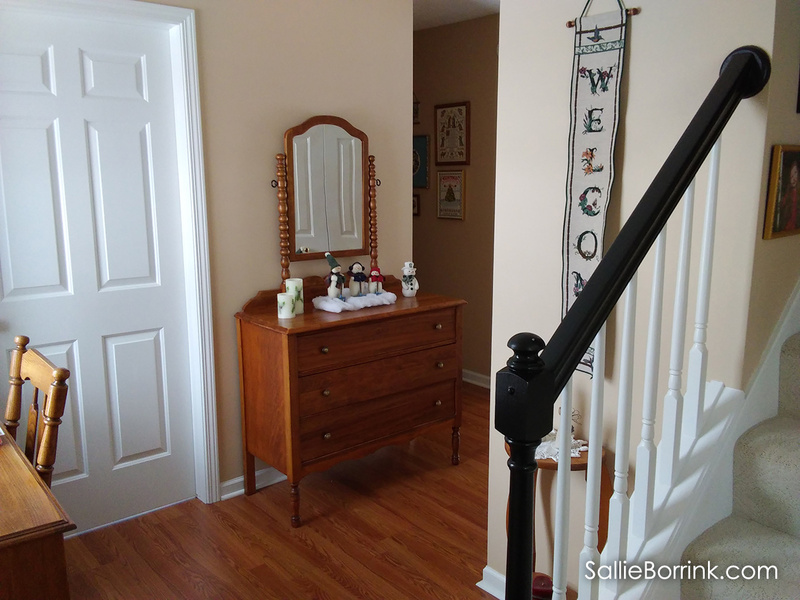 Your home is lovely, thank you for sharing the remodel. Thank you! I waffled the longest on the red decision and it’s one of the things I love the best! I love the changes you made! It is so warm and cozy. I remember when we looked at the house we now live in, our Realtor kept telling us we could paint over the color. She also had been our Realtor when we sold our previous house years before and had me paint everything beige to sell it. I loved every bit of color in this house, even the yellow bedroom. We have lived here eleven years and have not changed any colors. The bathroom needs to be repainted soon but that is it. Stephanie and her husband decided to downsize a little over a year ago, partly because the cost of heating a large house in New England is ridiculous. (That is why they originally wanted to build an environmentally friendly home but the cost would have been impossible.) They bought an open concept home that gives them more space than the stats would indicate. While they loved the house, it was the location that sold them on it, next to a beautiful little lake and only ten minutes from their church. 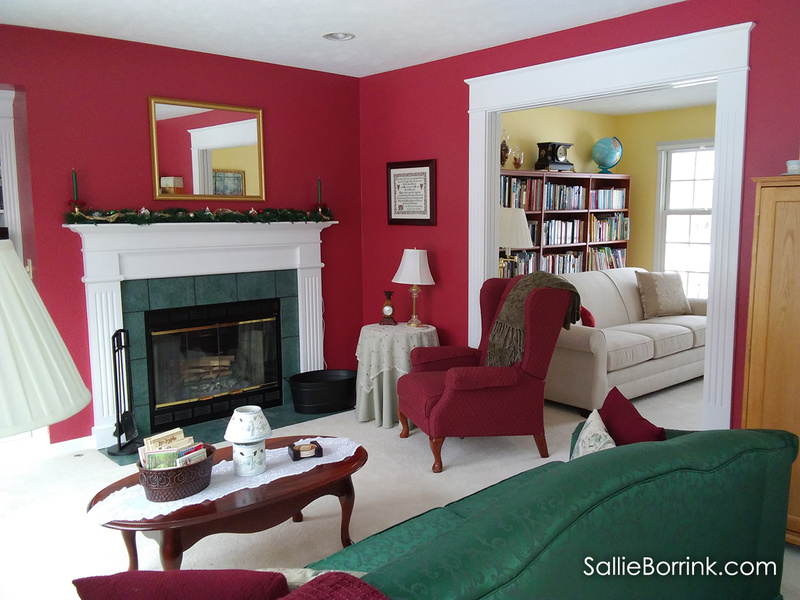 When we purchased this house, every room was the right color for our furniture with the exception of Caroline’s room which was a putty-like taupe. She wanted purple so we painted it a pretty rich lavender color before we moved in. Our bedroom was a sage green that perfectly matched the bedding we brought from our previous house that is sage and lavender. So we were very fortunate that we could live with the colors that were here for a number of years. I would become seriously depressed if I had to live in a house with all beige or – even a thousand times worse – all gray walls. Gray is the one color I cannot abide. I can live with taupe. I could even live with orange. I cannot abide gray. It is so depressing, especially when you live in a state with a fair amount of cloudy days. I saw the pictures of Stephanie’s house when she wrote about it on her site. It’s lovely! She was going to let her domain name for her blog lapse just because she is so busy as a leader of Classical Connections in her part of Massachusetts. However, she told me when it came time to give it up she couldn’t. She is leaving the door open to blog again. I tell her she does not have to write a perfect post each time (as a first born almost only child, perfectionism exists). It also doesn’t help that one of your good friends is an amazing writer like Sarah Clarkson. She never did finish the story of how they came to buy this house after multiple closed doors and losing thousands of dollars to an architect. It was definitely God’s leading but in a way she would have preferred not to travel. Sallie, your house is beautiful. I love your color choices and arrangements. 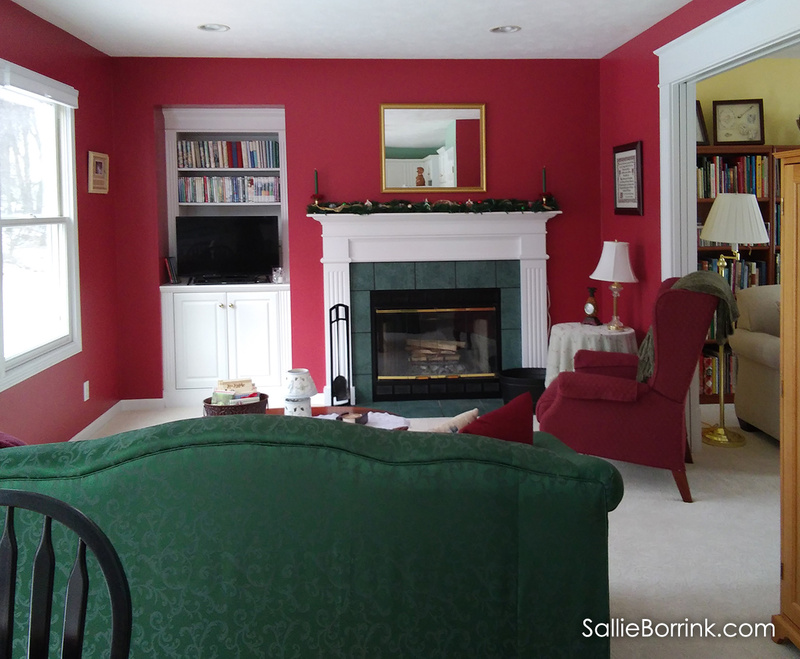 Yes, the red paint is amazing and just perfect with the greens in that room and in the kitchen. Your colors complement each other beautifully from room to room. You did a fabulous job. We also recently remodeled and I love the feeling of being in a cozy, comfortable space with my colors and choices which are very similar to yours. Thanks for your lovely descriptions and sharing this part of your life with us. Thank you, Elizabeth! 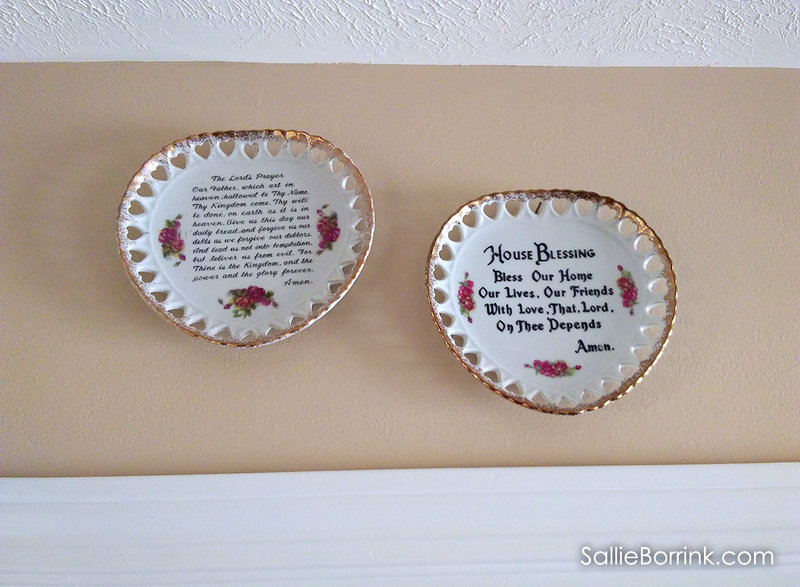 Isn’t it a blessing to be in a home where you feel comfortable and that reflects who you are? Oh Sallie, it’s beautiful. We had very similar colors in our last home, and I loved it. Now we are working our way to more neutrals, browns, and greens. Most of our furniture has been replaced with older more primitive pine pieces. One thing we will probably never change is our original 1950’s pink bathroom. I hated it at first sight, but knew we were years away from changing it, so I decided to choose to love it, and now I do. Pink tile floor, pink tile walls, pink toilet, tub, sink, and pink tile counter top. And I don’t even LIKE the color pink. Your home looks so inviting and peaceful! Especially the chair by the fire. We have a pink bathroom too! Tile on tub surround and 1/2 of walls + all American Standard fixtures that I’ve seen in vintage ads + almost identical to the “Mamie Eisenhower pink” bathroom in the Marjorie Merriweather Post home– Hillwood in Washington, DC. We’ve learned to love it; I just can’t see tearing out quality-made vintage fixtures. I love the primitive look too; we have a pine plank floor in kitchen. I’ve even been known to decorate it for Christmas. I have a small aluminum tree that I fill with vintage pink Shiny Brite ornaments – also very 50’s. The other thing I like about it is that it’s just a bit TOO much pink for my husband, so he has chosen a different bathroom as his own. Win/win! So lovely Sallie! So happy for you. I love home tours that are so cozy & inviting 🙂 We are definitely kindred spirits in decorating. I love a white/light kitchen and you made a great countertop choice. 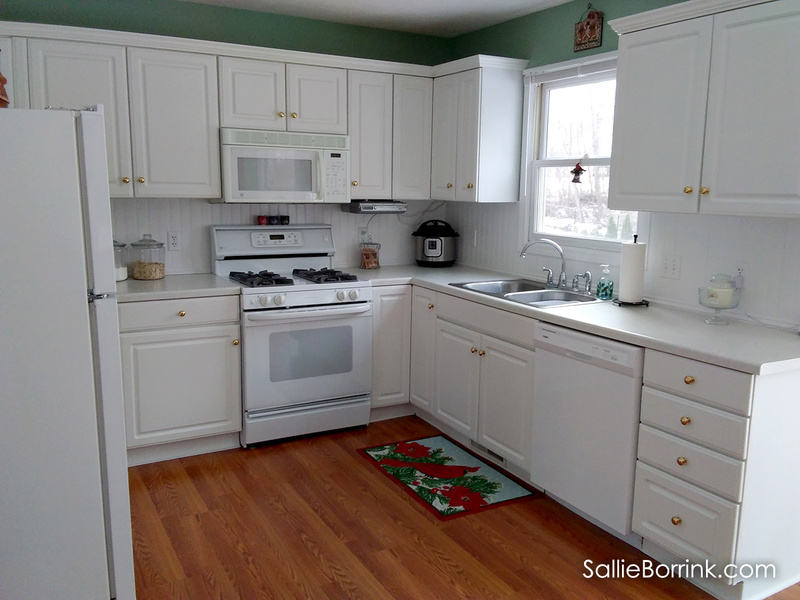 Our old 1950’s cabinets are painted a very light tan & we have a slightly darker Formica countertop called Sand Stone. I almost went w/Corian so I could have an under-mounted farm sink, but it was so much $$$$ that I just couldn’t do it- I am actually glad that I didn’t. I still love my countertop after 11 years, but should have found a higher quality drop in sink- still looking for a sturdy, single bowl, white replacement. I love all your colors. We have a similar red in our tile countertop for the cooktop area, off white/red checked curtain, and entry & sink rugs in kitchen. We have a deep green area rug in living area and a green/navy/burgundy sofa, with warm tan walls(very similar to the wall color in your last 2 photos). 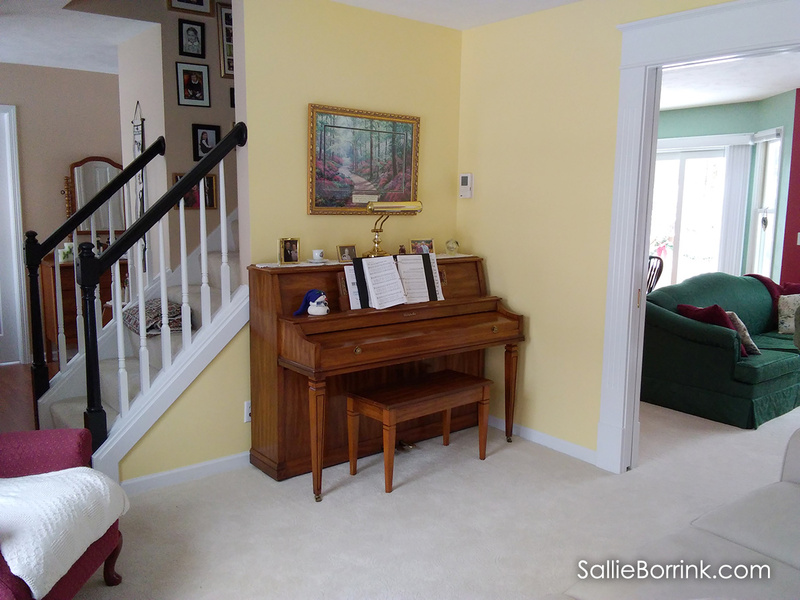 We tried a similar yellow – but it was too much because we have so much sunlight from so many large (old house) windows and it didn’t quite go with the existing sofa- that I still love after almost 20 years. My girls used a similar blue color in their shared bedroom. 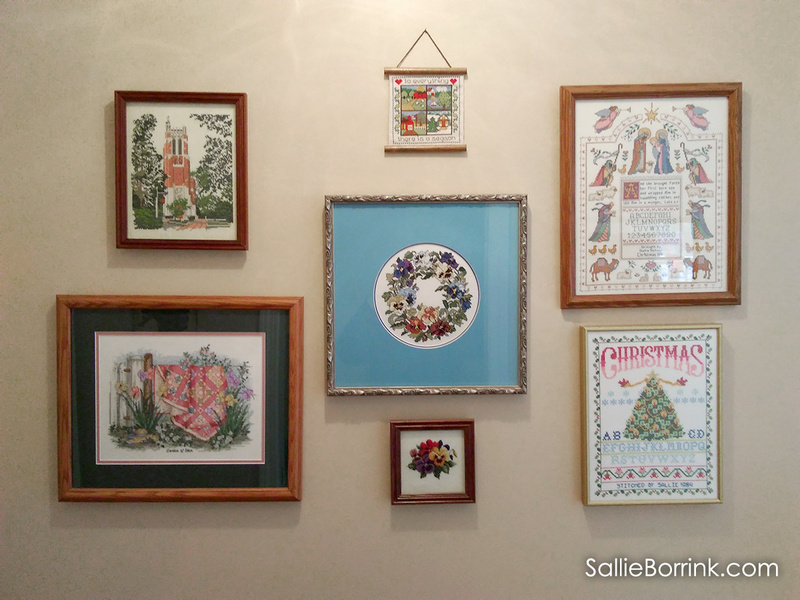 Your cross-stitch samplers are beautiful. I need to find mine again & put them up; my married daughter recently displayed hers. We also have our piano next to the open stairs, and we use antique wood dressers & an old wooden cupboard w/glass doors for storage. My bedside “table” is an antique commode w/ornate mirror frame and a marble top – we inherited it from my husband’s grandmother who lived a cosy life with collected antiques and cane chairs, she re-caned herself. And we have bookshelves in every room except the bathrooms- ha. Your carpeting is beautiful – when we moved into our home, there was a similar carpet, made of wool; if it was your color instead of a pink/taupe shade and not already 30 years old, I could have kept it. We have all oak floors in living spaces & bedrooms. Thanks for sharing your cozy home. Wow! We do sound like kindred spirits with decorating! LOL! I like your use of color, especially the greens; they are all colors that can be lived with and enjoyed for a long time. I also like your oak furniture, and the beadboard backsplash. Your style is timeless, yet at the same time fresh and clean. And now you’re through with almost all of the messy remodeling work! I’ve had greens throughout most of my rooms in every place I’ve lived. 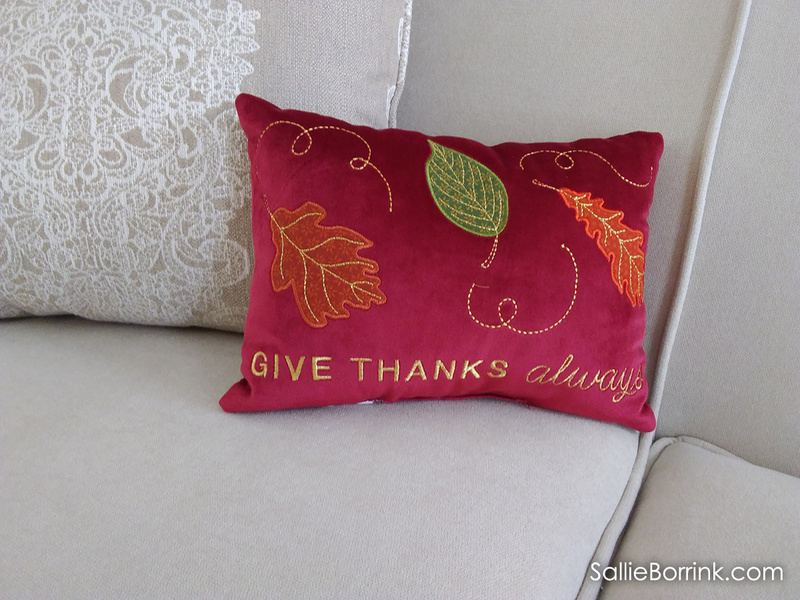 It seems to be something that ties together how I decorate and I find it restful. Thank you for your kind words! I thoroughly enjoyed your tour. 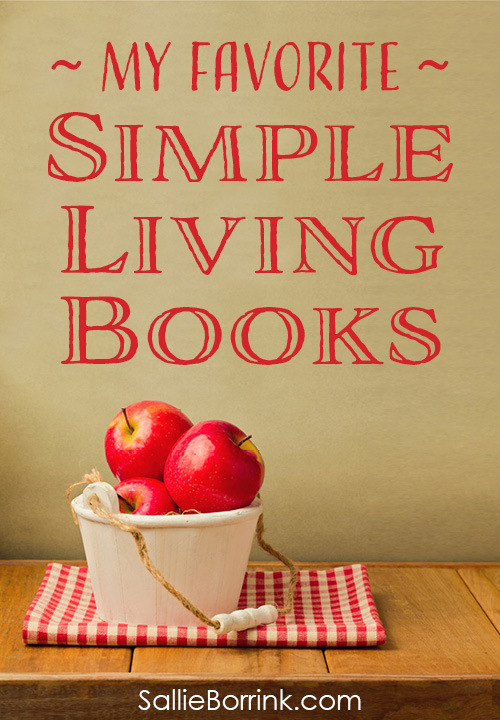 Cozy homes are the best – with real wood furniture, handmade details, bookshelves and pianos. 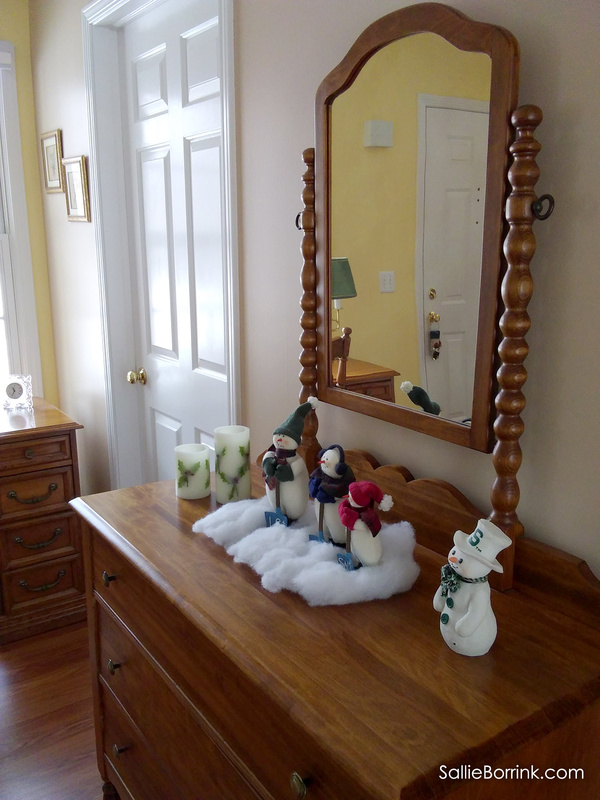 Your home is every bit as beautiful and welcoming as the coziest bed and breakfast I’ve had the pleasure to visit. Your home turned out so lovely! I like the idea of having a bit of a neutral palate in certain spaces so you can change decorations through the seasons. I do love all the colors you chose and the antiques. I love antiques. Enjoy your beautiful peaceful place! 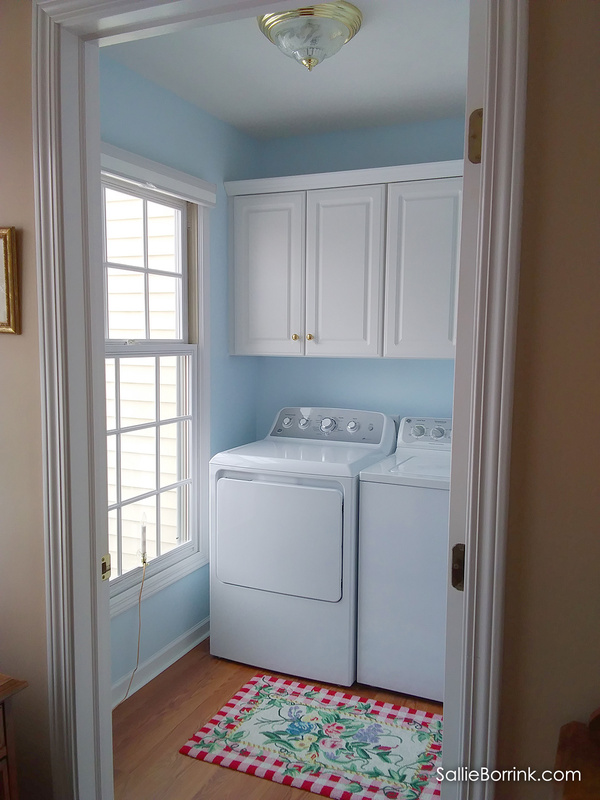 I love the color of your laundry room. Do you know what brand and color it is? I was wondering the same thing! It is so beautiful, light and airy! I am pretty sure it is Behr eggshell, but we pulled the can out and can’t figure out the color. The top label is partially cut off and I’ve tried to find the color name on both Google and Home Depot’s website and I cannot figure it out. I’m sorry!